Munich is the capital of Bavaria and third largest city in Germany. Munich is the capital of Bavaria and third largest city in Germany. Located at the river Isar in the south of Bavaria, Munich is famous for its beautiful architecture, fine culture, and the annual Oktoberfest beer festival. Munich’s cultural scene is second to none in Germany, with the museums even considered by some to outrank Berlin in quality. 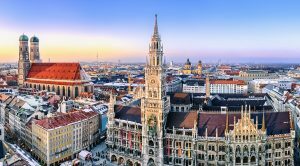 Munich is also a major international centre of business, engineering and research exemplified by the presence of two research universities, several multinational companies and world class technology and science museums like the Deutsches Museum and BMW World. Munich’s economic strength is founded on the diverse economic structure, the wide range of growing industries and the successful composition of global players. It’s central location in Europe makes it a hub of business activity and an attractive location for multinational organisations. Munich is famous for its breweries and the Weissbier (wheat beer) is a speciality from Bavaria, however Helles (lager) is the most popular Munich beer today. There are around 20 major beer gardens, with four of the most famous and popular being located in the Englischer Garten and the largest one in the Hirschgarten. The Hofbräuhaus is one of the oldest breweries in Munich and a favourite amongst tourists. Munich has an excellent variety of restaurants ranging from traditional Bavarian, to Sushi and Italian. The nightlife in the city is thriving. Popular areas include Schwabing, which is a favourite amongst students and artists, around the Marienplatz in the centre of the city and Kultfabrik for clubs. Three weeks before Christmas, Munich comes to life with traditional Christmas markets, the most famous being the Christkindlmarkt at the Marienplatz. With around 40 trade fairs for industrial goods, consumer goods and new technologies, Messe München International (MMI) is one of the world’s leading trade fair companies. Currently, MMI organises 14 international leading trade fairs, including the largest trade fair in the world, bauma. Every year MMI welcomes over 30,000 exhibitors and more than 2 million visitors to Munich. Internationally, MMI organises numerous trade fairs in Asia, Russia, South America, and the Middle East. Visiting Munich? Why not download the Munich City App!